Home Companies Jiangsu Fangsheng Machinery Co., Ltd.
1. This mineral water bottle recycling mainly used for dealing with waste PET bottle, barrel etc. 2. To separate PET bottles to flakes from label, cap, oil, garbage. 3. This PET bottle washing machine is composed of separator, crusher, cold & hot washing system, dewatering, drying, packing system, etc. 4. Easy to operate,Full automatic. The boss is a technical engineer and has a strong technical R & D team, for your products to provide long-term free technical support and services. 1.Final products has good quality. When processPET bottle, final products humidity below 1%, impurities100ppm,PVC label content 100ppm . The whole line capacity between 300kg/h-2000kg/hour. 2.Parts which contact material use SUS304 stainless steel, thickness more than 3mm, ensure long service lift time. 3.World famous brand components applied on the production line- e.g. SKF bearing, Siemens contactor, Omron temperature, FUJI invertor, Siemens PLC controller, etc. 4.The whole production line with CE certification, ISO9001 certification. Jiangsu Fangsheng Machinery Co., LTD. is the professional manufacturer for all kinds of plastic machines which is a blend of researching and developing,designing,manufacturing and operating. 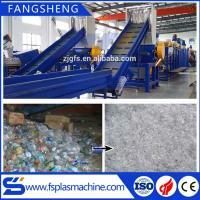 We are expert for manufacturing waste plastic recycling machinery,plastic extruder and their auxiliary machines. Our products are mainly exported to American, British, Germany,Russia, Brazil, Australia, Ukraine, The Czech republic, Poland, Saudi Arabia, Mexico, Ecuador, Philippines, India, South Africa, Ghana, Tanzania, Malaysia, Egypt, Japan, Indonesia, New Zealand Vietnam etc.countries and areas. 1. Are you manufacturer or trading company? Answer: we are manufacturer,all the machine ,we make it ourself to reduce the cost of our customer. 2. The quality of the machine is good?